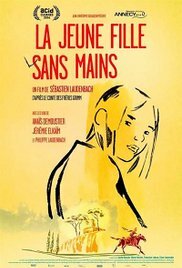 The Girl Without Hands (French: La Jeune Fille sans mains) is a 2016 French animated drama film directed, written, edited, and animated by Sébastien Laudenbach in his feature debut; Laudenbach animated the entire film on his own. The film is based on the Brothers Grimm fairy tale of the same name and stars the voices of Anaïs Demoustier and Jérémie Elkaïm. It premiered in the ACID section at the 2016 Cannes Film Festival and played in competition at the 2016 Annecy International Animated Film Festival, where it received the Jury Distinction award. Read more on Wikipedia.